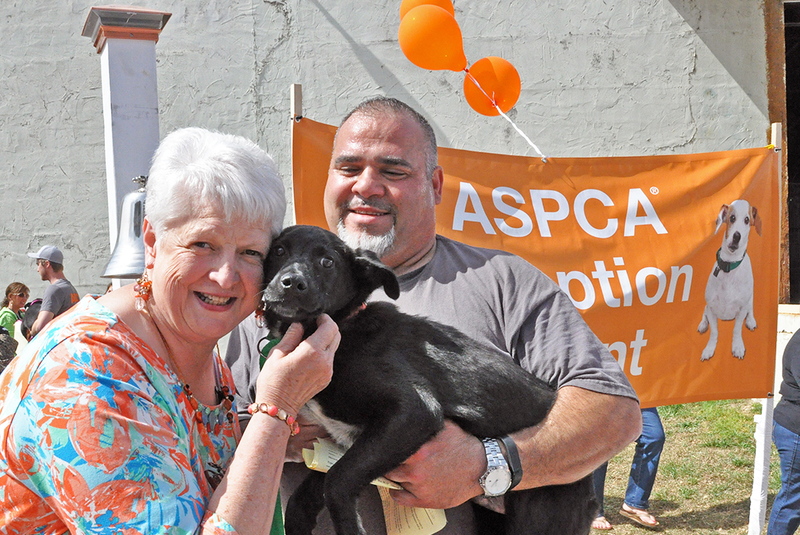 UPDATE 3/23: We want to share new video footage of this heartwarming adoption event. Meet some of the pets—and the families who gave them a second chance—below. Thank you for your incredible support. 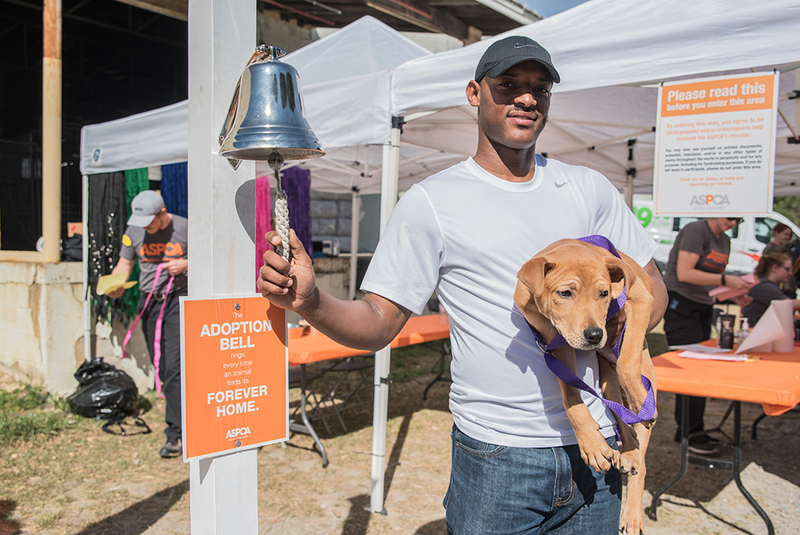 The bell rang 524 times over two days to celebrate each rescued dog or cat that was getting a second chance at life. 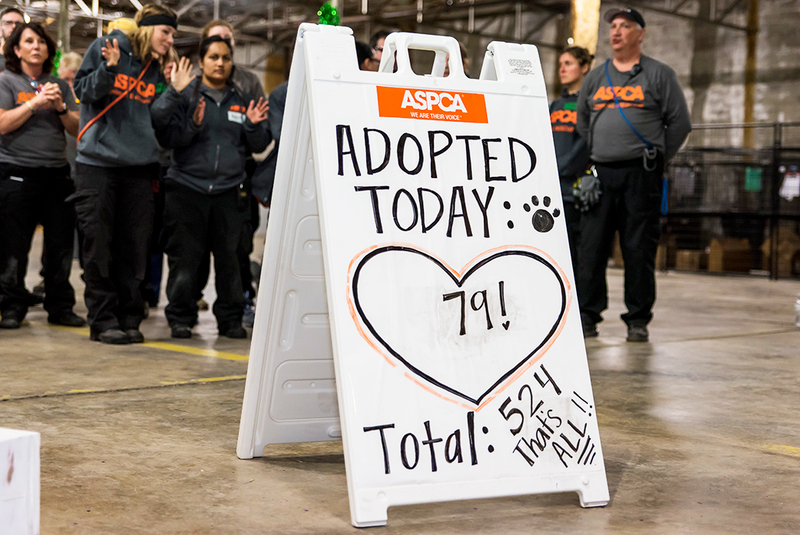 Those hundreds of second chances came during an adoption event hosted by the ASPCA in Sanford, North Carolina, for animals rescued from deplorable conditions from an unlicensed facility in Raeford, North Carolina, in January. Thousands of adopters from Sanford and communities across the state—and even a handful from out-of-state—arrived on Friday, March 18, to attend the event, which was expected to last through Sunday. At 7:30 A.M. Friday, Christopher James F. and his mother, Rita, were first to pull into the parking lot next to the ASPCA’s temporary shelter, where cats and dogs had been prepared for adoption by hundreds of ASPCA responders and veterinarians and eagerly awaited homes. Christopher and his mother drove to Sanford from Greensboro on Thursday evening, but unable to find a hotel vacancy, they returned home and rose early Friday for the drive back. In less than an hour, cars jammed the lot, and overflow traffic was diverted to an adjacent lot. Some drivers simply parked elsewhere and walked. 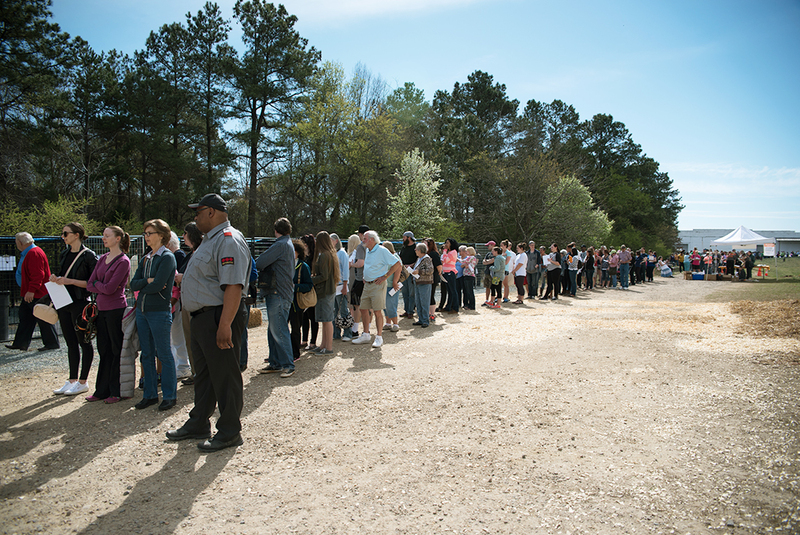 By 9:45 A.M., at least 300 people were in line, and groups of 50 at a time were ushered to a large shaded, tent where they filled out adoption applications. The line numbered 300 by 9:45 a.m.
James F. and his fiancée, Jessica Z., of Lemon Springs were the first to ring the adoption bell. They chose Bentley, a red-colored mixed breed pup, and at 10:15 A.M. the happy couple headed to a nearby park with their new pooch. James F. was the first to adopt, taking home a mixed breed pup named Bentley. A pair of bonded dogs—Rottweiler Boston and retriever mix Baxter—were next. They went home with Elena and Wayne M. of Lower Aberdeen, who have spent years helping needy animals. “They did them [these animals] wrong,” said Elena. Wayne, an Elvis impersonator, routinely sings Elvis favorites to the couples’ dogs, and rang the bell twice. At 11:00 A.M., the bell sounded for “Angel Face,” a cat adopted by Sharon S. of Sanford. Sharon was looking for a tabby, but left with the all-white feline because “she drew me in.” Michael B., age five, chose a cat named Tammy Lynn, because “she was cuddly and reached out and touched my fingers.” His mother, Christine, explained that the family’s older cats had recently passed away, and they’d been thinking about bringing home a “new baby.” Michael arrived looking for a “polka dotted” cat, but Tammy Lynn, solid black, won him over. In a similar story, Linda O. of Robbins described how her 15-year-old dog “B.B.” had died just days ago; she adopted a black-and-white shepherd mix she named “Precious.” With tears in her eyes, Linda spoke of how she circled the adoption floor four to five times and was convinced that Precious chose her. “She reminds me of B.B.,” Linda said. Precious went home with Linda O.
Nina, a purebred German shepherd, was adopted by army veteran Ronnie S.. Ronnie is the founder of the non-profit group Wags4Tags, which trains rescued shelter dogs to be companion and emotional support dogs for veterans suffering from PTSD and other issues. Ronnie plans to train Nina as a canine good citizen and public access dog before she becomes his personal service dog when his current dog retires. Nina, a German shepherd, was adopted by Ronnie S., for training as a service dog. 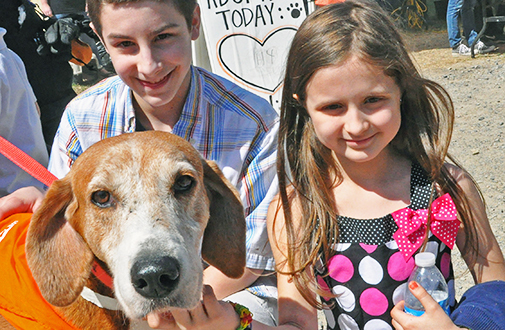 Staff favorites like Jake, an older hound, went home with Anna H. and her two children. Sunshine, a reddish-tan pup credited with bringing sunshine to ASPCA caretakers on long, arduous days, went home with Melinda B., a paramedic from Cumberland County. Huggie Bear, a black-and-white cat famous for hugging his handlers, and Bobbi Sue, a 10-year-old black Lab mix with a solid gray muzzle, also found homes. 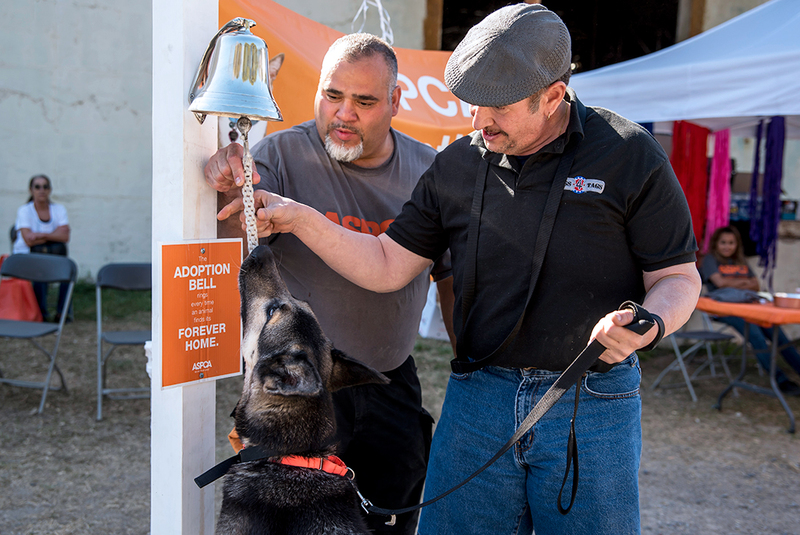 By 6:00 P.M. Friday, the adoption bell had rung 430 times, and 2,600 people had passed through. Roughly 100 animals remained. Owen, an older, heartworm positive dog, was one of the remaining pets. On Saturday, he had the special honor of being the last dog to leave. He was adopted by Angel K. and her 14-year-old daughter, who chose Owen as a companion for Angel’s husband, a former police officer and army veteran who served five tours in Iraq. 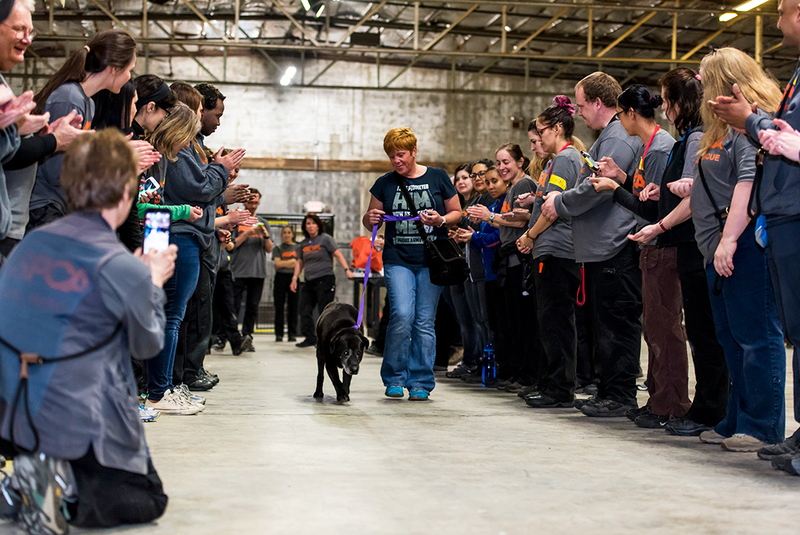 A sea of 170 ASPCA responders —singing, “For He’s a Jolly Good Fellow”—parted as Angel walked Owen through. Owen, a heartworm positive dog, was the last to leave. 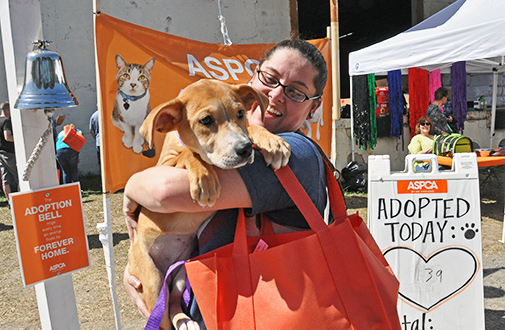 In total, nearly 3,500 people made their way to the event, and all 524 cats and dogs were adopted. Remaining animals not yet available for adoption, as well as 68 farm animals, are being placed with the ASPCA's network of animal welfare agencies. The bell rang one last time.